This morning I attended Restoration Church for the service honoring Don Munn (son-in-law Nathan’s father) for his 34 years as the Senior Pastor. Don is changing roles and is “passing the baton” to another Senior Pastor who has been working with him for months on this transition. 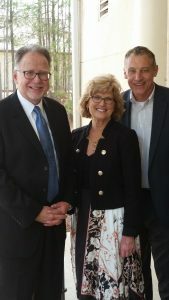 Don shared a powerful and encouraging message and took the lead in recognizing Chuck Ramsey as the new Senior Pastor. It was a delight to be there to see this take place. In the last few weeks I have made a list of six Senior Pastor friends who have left or are in the process of leaving their churches. These transitions can always be challenging and some go better than others. This was certainly as well planned celebration and transition that has set a high bar. It was an honor to be in attendance. As the transition of authority was shifting from Moses to Joshua, there is one command, one challenge, that is associated with this transition. It is the call to be “strong and courageous.” This command is first given by Moses as he is preparing Joshua for the time of his transition to a position of leadership. This last verse is the one most memorized by children in Sunday School, but it is the third time the command has been given to Joshua. The reality is that the only opposition a leader faces is not “outside” sources. It is often the “enemy” within that can be the greatest challenge. As a result, courage and strength are needed at every turn and in every situation. There are two specific reminds that Joshua is given to bolster his courage and strength. One is to remember the Lord your God is with you. When we feel alone, we are not alone. When we feel weak, we can trust in the strength of the Lord. Our courage is from the presence of the Lord, our strength is that which the Lord alone can provide. Knowing God’s Word, meditating on God’s Word helps us to apply God’s Word and reminds us of who the Lord is and what He has done for His people. This was to be a key to Joshua’s success and it is for us as well. Prayer for today…. Lord we all need strength and courage to face the challenges of life. Help us to understand those qualities don’t just come from us but come to us as we focus on You and Your Word.